1850s · Dress · Finished! Smiling because I'm so glad to have this dress done! After a frantic week of last-minute sewing, I finally finished the green plaid fan-front! I wore it this past weekend at our first event of the year, “Sowing to Sewing” and received many lovely compliments from the fabulous people that I reenact with. I was a bit worried about the dress being out of date, but we managed to come up with a story about me cutting down a bigger dress from a larger auntie, and a lack of excess fabric left me with no choice but to have slim sleeves (thanks for that one, Auntie B!). I’ve written a review of this pattern, which you can read here. I’ve also added the dress to the portfolio (it’s a bit empty now, but will hopefully fill up soon). I’m taking a break from historic sewing for the week to catch up on some “real-life” things that need getting done, but after that, I’m moving on to my next project: updating my underpinnings! Getting dressed this weekend made me realize that I have enough dresses, but the undergarments that I learned the basics on are starting to get worn out. So, a new corset, chemise, and drawers are in order for the month of May. It was so pretty Anna! I loved seeing it in person. Well done! Thanks, Victoria! It was lovely to see you in your new dress and bonnet, as well. I agree, you did a beautiful job! I saw you blog while searching about the Laughing Moon Pattern, and I am almost done the same dress as you made, for my niece. I’m having the exact same trouble as you too, with it bunching up way to much in the front. I wondered if you eventually fixed yours, and if so, how? 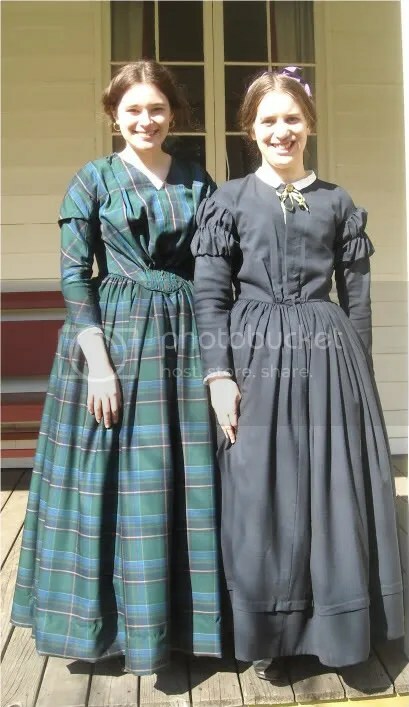 If you could let me know, I’d really appreciate it–this is my first historical dress, so I don’t have much experience. I’m still working on re-working this dress, but even during the construction, I got rid of some of the excess bunching in the front by smoothing the fabric up towards the shoulder seams, until it lay flat on the lining. I ended up having about an inch of overhang after doing this, and so I just trimmed this off. The bunching is caused by excess length in the bodice and even though I shortened the bodice on the pattern prior to cutting the fabric out, I unfortunately didn’t shorten it enough. The weight of the skirt (when attached) will also pull the bodice down and smooth it out a bit, too. Good luck with the dress for your niece!